Alpine huts from Mount Watzmann to "Lattengebirge"
Alpine huts were very important in the past for the very small and poor farms in this barren landscape. Every small part of this cultivable land (up to 2000 meters above sea) meant that the farmer was able to keep more livestock as well as bring more livestock through the winter as the meadows in the valley were spared for the hay harvest. The dairymaid spent an unimaginably hard summer in a hostile environment, far from the protective farm. Some wayside crosses remind of the maids who left their lives there. In the sixties and seventies, milk production in the valley was very attractive thanks to good milk prices and advanced fertilizer technology. Many alpine huts were neglected or even abandoned altogether during this time and many alpine rights were irretrievable. We are delighted that the alpine huts are beginning to blossom again. 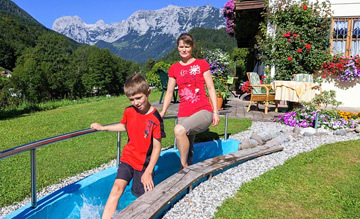 Especially in Ramsau, alpine farming is still very traditional and original. Every local is looking forward to this most beautiful time of the year. 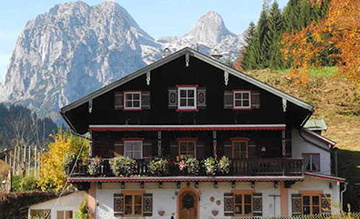 Whether on foot or by mountain bike, whether alone or with friends, a day trip to a alpine hut is unforgettable. A hearty meal in front of the alpine hut, the observation of the peaceful grazing cows, the idyllic bell ring and the intoxicating landscape that impacts on one leads you quietly back to the essentials in life that we are all looking for.